Are you planning a baby? Pregnant? Nursing? Zahler Prenatal+DHA has the optimal combination of 25 vitamins and nutrients plus 300 mg of DHA. DHA aids in vision, bone function, immune system, neural tube, and mental health. 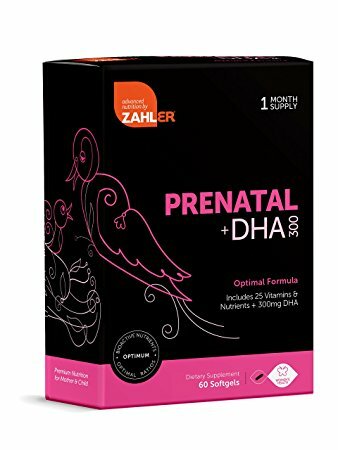 Prenatal + DHA provides premium nutrition for both mother and baby. This Prenatal vitamin supplement is a balanced synergistic formulation provides a curated compilation of nutrients that your developing baby requires for absorption, metabolism, and safety. It can be taken for months before conception to ready your body for pregnancy, during pregnancy, and while nursing. This product is manufactured in the USA, in a state of the art GMP and NSF certified facility. This is a great product, I wanted to share it with all of my readers to help ensure healthy babies and moms. I received this product at a discount.